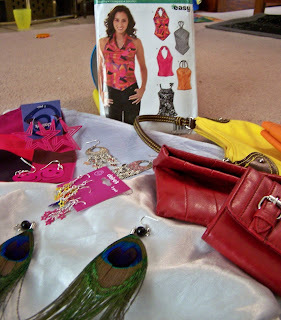 Did anyone else read that Claire's, the popular Accessories store, is going out of business? Well, last month I was at my local Outlet mall, and I spotted their going out of business sign, and with a few bucks in my pocket I decided to pounce. I started with these selections. 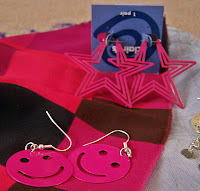 I'm not a big pink person, and decided these earring would go fabulously with this fabric I had at home, ready to go for a shirt i have yet to make. I'm addicted to Happy Faces, always have been. Stars are cute, and completely classic when one wants to have fun. On to these beauties. 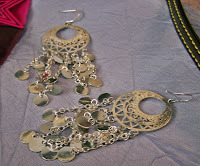 I love silver earrings, and these jumped right out at me from the shelf...honest. They begged me to buy them! So...I obliged. Very pretty, and go well with the sweaters I have in my closet, which is good cause that's pretty much all I wear during the cold months. 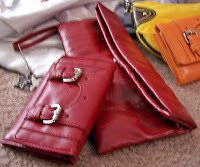 And last is this red leather clutch & wallet, again both for under $5. It came with a fancy little star charm on the handle, and it has a magnetic closure, along with a snap when it's unfolded. It doesn't hold very much, but that's the point, and it reminds me to go conservative, bringing only bare essentials with me. Did I mention I only use these small things when I go dancing? In total my bill was around the $25 area. Ever since I got such a great bargain I've been dying to return to see what else I can pick up, but have yet to make it there. Did I also mention that the picture at the top with the pattern on it is one I'm considering using for the shirts I have planned? OMG! That really is a bargain! I wish I could wear costume jewelry. I can only wear gold in my ears or I get an allergic reaction. 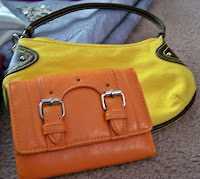 I'm LOVIN' that orange wallet! You had some great purchases there, Amber! I used to have a set of peacock feather earrings when I was in middle school. I'm not sure what happened to them, though. Too funny - I am always happy to find bargains like that. Over the weekend I spent $15 on 4 shirts on the clearance rack at the Gap. Good stuff.